Well I don’ t know what to post about today. Didn’t sleep worth a dang. Wife gone to the gym. Gotta take Sheba the itcher to the vet again. Everybody easily guessed my “what is it?” picture yesterday. I shouldn’t even bother posting this. You should patent a T-shirt with that on it, if there's not one already. Coffee Is My Only Friend, I mean. Not the crab. I feel much better after making the blog rounds this morning. Not a nice day, is it. Take Sheba for some sea bathing every so often. It can help with itchy skin. If you have her on kibbles, throw that out and give her some food without grains and put crushed raw garlic in it. It does wonders for a dog's itchy skin. Next time, post a photo that doesn't look like anything. Nobody will guess that right. I'm tellin' ya…get off that gluten. You'll sleep better. Now, that I've nagged you, I hope you have a better afternoon than you did morning. Och, you poor baby, I'm you're friend, you should come recuperate from life's ill's over here, for a bit (I'll make up the shed for you). 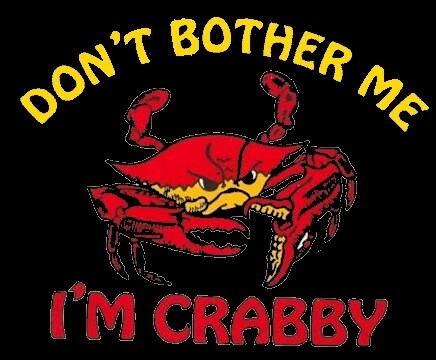 Blast, I'm not the only one crabby then!I hope you feel better soon mate.